djay Keyboard Cover, Other Misc. Product from Algoriddim. 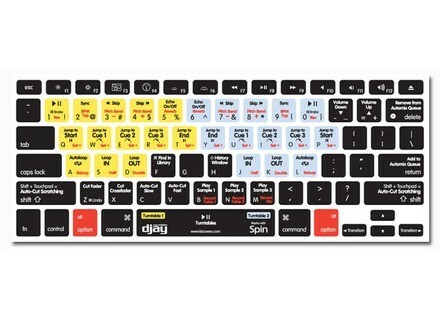 Providing color-coded buttons with symbols to help identify key functions and distinguish between djay’s extensive shortcuts, the djay Keyboard Cover transforms your Mac notebook into a DJ controller. In addition to MacBook and MacBook Pro notebooks with US keyboards, the covers are now also available to users of the original (silver keys) and European Mac notebooks. The cover consists of silicone that won’t slip off the keyboard and is non-restrictive to regular typing. And as an extra, it also helps to safeguard your Mac from dirt or spills at the party. The covers are available now for just $29.95 from the KB Covers website. You can enter the code DJAY10 at checkout to receive a 10% discount (limited time offer). Xantech MRKP2 Keypad Featuring a 2.4-inch TFT LCD touchpanel, the MRKP2 keypads were designed to offer contractors and system integrators customization for system configuration. Cinematique Instruments Experimental Box v2 This time CI focus on objects and elements they found in the smithy of an artist blacksmith. BSS Audio Soundweb London BLU-100 The BLU-100 offers a fixed configuration of 12 inputs and eight outputs, configurable signal processing, logic processing and a fault tolerant digital audio bus.